Many of us will cherish fond memories from years gone by when life in general and sailing in particular was simple, adventurous and, not to mention, cheap. One would simply take a small open boat, a tent and some camping gear and there was a world full of wonderful places and experiences just waiting to be discovered. We cooked on campfires, slept fitfully in leaking tents; we made love under the stars and acquired a taste for tinned food and warm beer. How smug and superior we felt when sharing a particularly beautiful anchorage with what we'd call "a rich man's yacht" and enjoy exactly the same scenery as "that millionaire"! Later, as we grew older, we grew accustomed to "creature comforts" in our lives and on our boats. Our sailing indeed has become more comfortable but somehow, at times, the sense of discovery, of excitement and adventure seems to have diminished in the process. What we wanted was a light, quick catamaran for two persons but one which does not capsize or fly a hull in strong winds and which has the largest deck space possible. The boat had to be strong enough to withstand habitual beaching and has lots of storage space to carry gear and provisions for extended camping voyages. A small engine to facilitate entering and leaving anchorages and to enable navigation on small rivers was required. Enter the hitia 26. She is derived from the Wharram Hitia 17 design, dimensioned upwards to 21 ft and with 1 m (3 ½ ft) extra length added. The deck is on top instead of between the beams and thus level with the hull tops and is therefore completely flush. Resulting usable deck space is no less then 16 sqm. 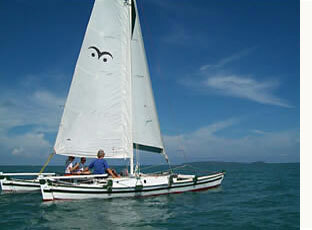 Rig is the wonderful Wharram oh-so-easy-to-handle soft wingsail sloop with a roller-reefed jib. A gennaker with "snuffer" for light down wind work comes as standard. The 3hp Yamaha engine is mounted just behind the mast, where it is at it's most efficient and does not snag the sheets. Although the engine is primarily meant for entering and leaving anchorages, the 12-liter remote fuel tank gives you 10 hours running time at 5 kts in flat water. 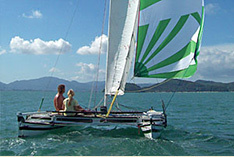 The hitia 26 is very easily driven. Her long slender hulls enable her to effortlessly reach cruising speeds of 8 – 10 kts. Lightly loaded in day sailing mode she will do 15 kts and more. The boat's draught is just over one foot (35 cm) so few places will be inaccessible. Overnight an igloo tent can be pitched either on deck or on the beach. With two anchors and plenty of rope (come as standard with the boat) she is well equipped for beaching. In camping mode the boat comes as standard with a 2 person igloo tent, 2 sleeping bags and mats, ground sheet, camping cooker with 4 kg gas, pots, pans, cutlery, kettle, 20 ltr cool box, 20 ltr bottled drinking water, torch, kerosene lamp and a basic provisioning package. In addition you get a set of waterproofed charts and tide tables, pilot book and a pre-charged mobile telephone. The obvious ideal sailing area for the hitia 26 is the Phang Nga Bay, the islands off Krabi, Koh Phi Phi, Koh Lanta, Koh Rok Nok etc. Here you find fabulous scenery and a myriad of islands, creeks, rivers and coves to explore. If you baulk at the idea of "roughing it" in a tent: The hitia 26 is also available for day-sailing from our base in Ao Yon. Nearby Ao Chalong and the waters between Koh Lon, Koh He, Koh Bon etc. 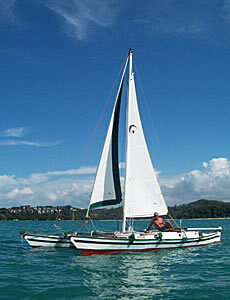 offer year round flat-water sailing. 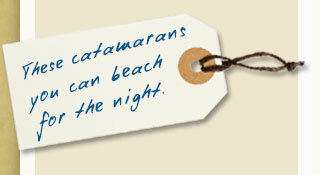 Overnight trips to Koh Racha, Koh Yao, or Koh Phi Phi are also possible. For those disinclined to camp, bungalow accommodation is readily available there. With her exciting performance, ease of handling, versatility and outright cheap rates the hitia 26 is the absolutely ideal boat for those who are either adventurous or poor or young or all of the above!